Introduction: The short-form 36 (SF-36) health survey has proven to be a reliable tool when assessing the burden of disease on both physical and mental health. Moreover, it is widely used to assess the effects of various treatment options on the overall quality of life. 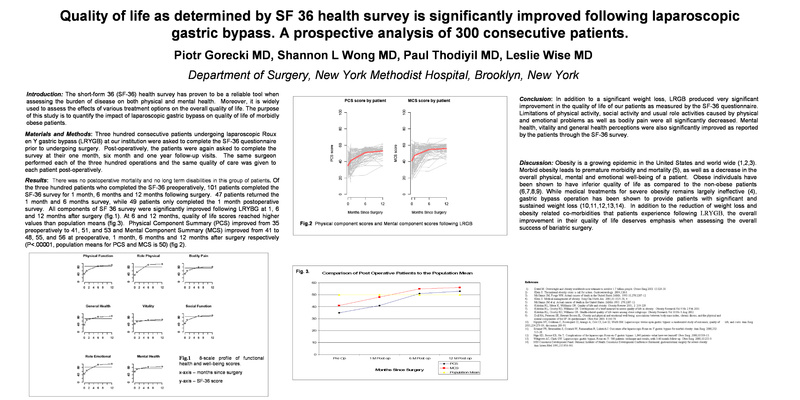 Using the SF-36 questionnaire, our goal was to quantify the impact made by laparoscopic gastric bypass surgery in the quality of lives of our obese patients. Methods: Three hundred consecutive patients completed the SF-36 questionnaire prior to undergoing a laparoscopic Roux en Y gastric bypass (LRGB) at our institution. Post-operatively, the patients completed the survey at their one month, six month and one year follow-up visits. The same surgeon performed each of the three hundred operations and the same quality of care was given to each patient post-operatively.